Let’s consider a scenario – Mr. Agarwal is a businessman and borrows some capital to expand his business. He has taken a Term Insurance Policy with his spouse as beneficiary (nominee). After his sudden demise, his creditors approached the court and asserted their right to get paid out of the proceeds of the Term Insurance policy. In this example, though Mr. Agarwal has taken a term insurance policy, his family has not benefited from it. The claim proceeds (death benefits) are given to his creditors. MWP Act was created to protect the properties owned by women from relatives, creditors and even from their own husbands. The Act has been created to protect women’s rights, even after marriage. MWP act is applicable for all married women of all religions. ‘Section 6‘ of the MWP Act covers Life Insurance plans. In this post, let us discuss and analyze the benefits to family members when a life insurance policy is taken under the MWP Act. Any married man can take a life insurance policy under MWP Act. This includes divorced persons and widowers. The policy can be taken only on one’s own name (the life assured has to be the proposer himself). Any type of plan (money-back / Term plan / Endowment etc.,) can be endorsed to be covered under MWP Act. Even a married woman can buy MWP policy on her name with her children as beneficiaries, the husband will not get anything from the policy. It will be considered as a separate asset as if she is unmarried. Getting a policy assigned under MWP Act is easy and inexpensive. At the time of making the application (buying a policy), a separate MWPA form has to be filled by the proposer for it to be covered under MWP Act. You need to provide details of the beneficiaries, the share of the benefits that are to be accrued to them and the trustees. Providing the trustee(s) names is not mandatory. Do note that the existing life insurance policies cannot be assigned under MWP Act. Can I Change the beneficiaries & Trustees names? Each policy under MWP Act is considered as a separate trust automatically (there is no need to create a trust). At the time of the proposal, you have to mention the names of the beneficiaries. You may also mention the names of trustees (not mandatory though). But, if the beneficiary is a minor then the appointment of the Trustee is compulsory. Trustee cannot be a minor / HUF (Hindu Undivided Family). Also, you (the proposer) can neither be the beneficiary nor the Trustee. The Beneficiary and the Trustee can be the same person (e.g. Your wife can be both the beneficiary and the Trustee). The trustees can be the wife and/or one or more of his adult children, or a third person. You (the policy holder) have the option to change the trustees at any point in time. However, the beneficiaries of the plan once declared cannot be changed. Can I surrender the policies which are under MWPA? Due to lack of awareness, very few policies are being taken under MWP Act. Life insurance is a tool to protect the dependent family members. If this purpose is to be achieved in its fullness, then having the life insurance plan covered under MWP Act is the easiest and the best way. So, the next time when you are buying a life insurance policy, suggest you to assign it under MWP Act. But, do not misuse the MWP Act with an intention to defraud your creditors. I dont think creditor(s) can attach the assets/life insurance in the said scenario. What if the beneficiary dies? The money will go to the proposer or it will be distributed according to the legal will of that beneficiary? What does the MWP Act say about it? If the beneficiary passes away, legal heirs would get the claim amount (if any). You may also include this in your WILL by mentioning the scenario. What is the procedure to change the trustee of a policy which is purchased under MWP Act? The policy holder can change the Trustee under MWP act but can not change the beneficiaries. But, beneficiary can not be changed. You can contact your Insurer and request for change of Trustee. Your insurer will add new Addendum accordingly. “The Proposer can appoint a person as a trustee or failing him another person as a trustee. Addendum. The beneficiary can also be appointed as the trustee. Please let me know if premium payment mode can be changed in policies taken under MWPA section 5 where the married lady wants to change he premium payment mode from annual to quarterly on the second Policy anniversary? Dear Kirti ..I believe that it should be possible. You may kindly contact your Insurer. my understanding is that for for a policy to be under mwpa, the beneficiaries have to be the wife or children etc. In case I am taking a term insurance policy with critical terminal illness/ disability benefits, then in that scenario then the money will be paid out to me = I am the beneficiary. Will such a policy be allowed under mwpa? Dear Austerm ..The death benefit in term plan is paid to the nominee. a) a working woman taking a policy can assign it under the MWPA to her children. b)whether a woman taking a policy with her husband as the nominee under the MWPA . A married woman can buy MWP policy on her name with her children as beneficiaries. 3. Wife and Children together or any of them. I dont think in this case The beneficiary can be Wife alone. It has to be option 2 and 3. Am I correct ? Can a unmarried.person take term insurence under mwp and.nominate his wife as nominee once he is married? Dear Pramod..No, it is not allowed. I have a query in a scenario wherein LI mentions wife and 2 kids as beneficiaries. Now, beneficiary wishes to access funds but one of the kids is minor. What are legal provisions and process around this? Dear Munish..What do you mean by partial withdrawal in this case? Assume that one has taken a term policy of 1 Cr with wife as the ONLY benificiary (ie 100%). a) If the wife dies before the husband ; Who is the benificiary ? Husband ? Wife’s relatives ? Children ? b) if the husband/wife dies together (say, in an accident), who is the be benificiary ? c) are there any hurdles if you create a policy under this ? If you have children, you may add them as beneficiaries in addition to your spouse’s name. Legal heirs can get the claim amount. my concern is, for a new policy, i can include my child details.. but for exisiting policy, (which is nominiated as only wife ) and under MWP , what are the safegurads one should take, so that there is no confusions in the event that the benificiary passes away first. Mr. A has taken MWPA POLICY and had his wife and children as the beneficiary. After few years he separated from his wife and the children custody are also fully with the wife. At the time of divorce he has settled the family property with her and the children. Thereafter after a passage of 15 years the mwpa policy has fallen due. Now the question is can he request LIC to make the payment to him directly as the beneficiaries are no longer related to him as wife / children. As fare as I am aware of, if the wife is the beneficiary named in the policy document, the policy would continue as a trust in favour of the divorced wife and would not belong to the Assured in spite of divorce. I have an term insurance plan for Rs 2 crores from LIC. which was taken 2 years back and my wife is the nominee in the same. My question to you is i had not taken this policy under MWMP act now if i have to change the same is it possible. Dear deepali..Kindly note that assigning of any existing life insurance policy under MWP act is not possible. 2 – You can assign LIC term policy under MWP act. Dear Steeksnth Ji If beneficiary (wife) diverce her husband what is the status of beneficiary? Will she continue the beneficiary of the policy ? Dear DHAMODHARAN..Yes, she would be the beneficiary. Is there is any example (case laws)? This is a definetly helpful article. I have a question about MWP Act section (5). Can u discuss it elaborately with an example? 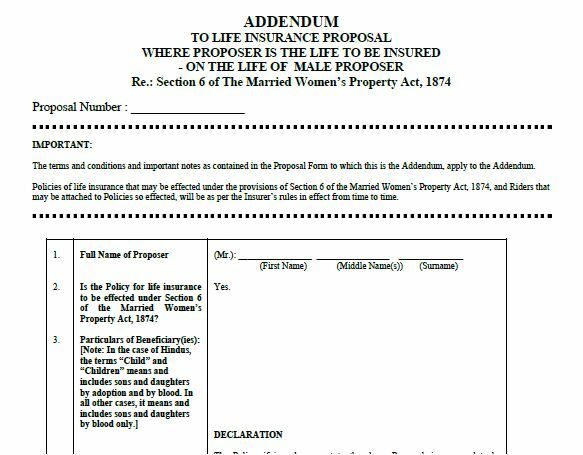 Can unmarried women also take insurance policy under MWP act.? Dear swati..No they are not eligible to assign the policy under MWP act. Thanks Sreekanth for the reply… So if married woman take any policy under MWP act so will it be called her sole property or asset and the husband wont have any rights on that property? Is she can make beneficiary to herself only in that case? Her husband won’t have any rights on that property. 2. Can she make beneficiary to herself only in that case? A “Proposer” has to be the “Insured”, but “Beneficiary” will be her child(ren). Thanks for the informative article. I had one doubt though, supposing the applicant has another child at a later date, and wants to include this child as an additional beneficiary, how will this work out because you mentioned that beneficiaries cannot be changed under this Act. Or would it make sense then to purchase another policy under the Act, and include the newborn as a beneficiary in this new policy? Yes, beneficiary (new one) can not be included in an existing policy. One can include in the new insurance policy. I would like my husband to take a take a policy on me and my 2children..
He’s not settled yet but has some assets..what would u suggest..
Let me know if you are an earning member of your family? Do you want your husband to take a life insurance policy on your name (you as the insured)? Is your husband adequately insured? 1. You may ask him to buy a “Term” Policy on himself. under MWP Act. i.e. Proposer = Insured = the husband. 2. Plus, ask him to name you (the wife), and the two children as “Beneficiaries”. Very informative article, I was not aware of this provision. I have a query, is there any extra premium to be paid to opt of MWP? Can we share the death benefits among wife, kids, and parents (% wise)? No extra premium is applicable. The benefits of the policy proceeds can be mentioned as specific percentages to each beneficiary or as equal amounts. I have a question, may be stupid question. If a person opted for MWP and suppose on his sudden demise, can’t his creditors approach his wife (directly or in the court or in any manner) to get paid out of the proceeds of the Term Insurance policy. No, then there is no point in assigning the policy under MWP act. You are 100% correct !! Under MWPA, Death benefits can ONLY be shared among wife and kids (% wise), and not the parents. 1. I have taken a online term insurance. I am about to fill the MWPA form. In the form, what should be done in N0.4 in the form for Trustees, in case i dont want to have trustees. 2. I am planning to have my wife as Nominee. So in a tough situation, if my wife passes away before me, who would be the beneficiary after my death. Can anyone get the amount after my death, or it would go unbenifited to my family. Mentioning the names of trustees is not mandatory. You may declare your kids as beneficiaries too (if you have kids). what if only wife is declared as the beneficiary and she passes away before the policyholder? If the beneficiary (wife) passes away, legal heirs would get the claim amount (if any). Thanks for providing useful information. Sir my two question please suggest answer 1) MWPA covered Children plan? Thanks a lot for the info. I need to know if we can have more than one plan under MWP Act. Like can there be one plan for wife (so that she can sustain herself) and second plan for children (so as to ensure that funds are available for their studies and marriage etc.). Yes, you can assign one or more policies under MWP Act. I want ask you that if Mr aggarwal & Mrs Aggarwal both are running company . Pls reply as soon as possible .. I do not think it is allowed. Very nice article thanks for sharing the details, i was not aware of this. Can you please let me know how to find if this clause has been added for the existing policies. You can not assign the existing policies under MWPA. 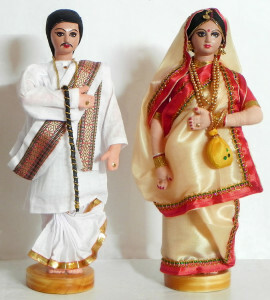 Only at the time of making the application (buying a policy), a separate MWPA form has to be filled by the proposer for it to be covered under MWP Act..
and another doubt is can we include our parents name in the above said MWP application form if we want to distribute in some ratio to life partner and parents…. This is available with Term insurance policies too. Parents cannot be added under MWP Act. This article is very informative. thank you for it. Definitely, comparing insurance quotes online will be helpful in giving better insurance policies. A very nice artcile. I am not aware of this till now. Good Information. I am interested in financial sector and seeking to become Certified Financial Planner. Could you please share your thoughts on how to start with? Kindly visit fpsbindia.org website, all the required info is available there. Hi Sree, thanks for the info. So, does it mean that if someone has insurance of 1 crore, and he is in debt of 70 lacs, the creditors will take whole 1 crore and not even 30 lacs was given to the nominee ! !